Warning: a bit of a rant follows. Do you have a Big Kroger Store in your neighborhood yet? These massive 100K+ square foot stores boast about the hundreds of thousands of items they contain. They post their mission statements, which invariably refer to “providing a pleasant shopping experience.” They forget they are a grocery store. People come for food. If customers need an alphabetized index to find eggs and milk, the store is too big. But wait! 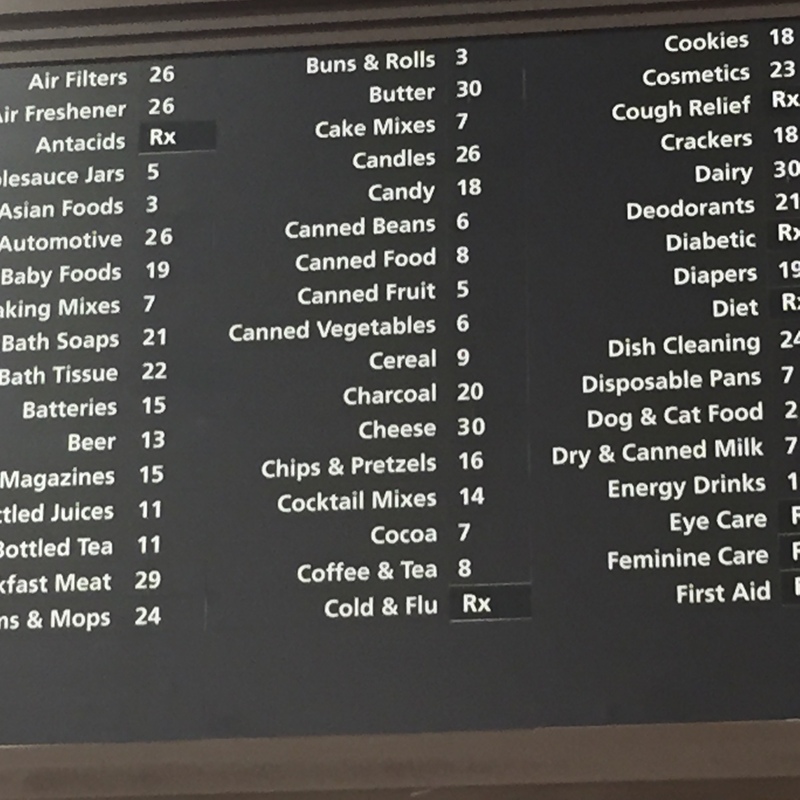 On aforementioned index in the last Big Kroger’s I visited (in Lexington, KY), milk and eggs aren’t listed. There’s “dairy” and that area of the store has both milk and eggs. Yet last I checked an egg is essentially an unfertilized embryo and not, uh, dairy. These stores are like a Work of Art that requires an interpretative talk. Does it touch my heart? Yes? Then it’s Art. No? Then it’s an academic pursuit. Can I find what I need for supper in 5 minutes or less? Yes? Then it’s a grocery store. No? Then it’s another reason to re-up my membership at the human-scale co-op. I don’t want to study an index when I go grocery shopping. I want to load my cart with the necessities* and get the hell out of there as fast as possible. Not listed on this grocery-store index: Eggs. Milk. If the store is so large as to require a PhD in index-reading, the employees need to be paid Top Dollar so they can provide topnotch directions to the confused shoppers. 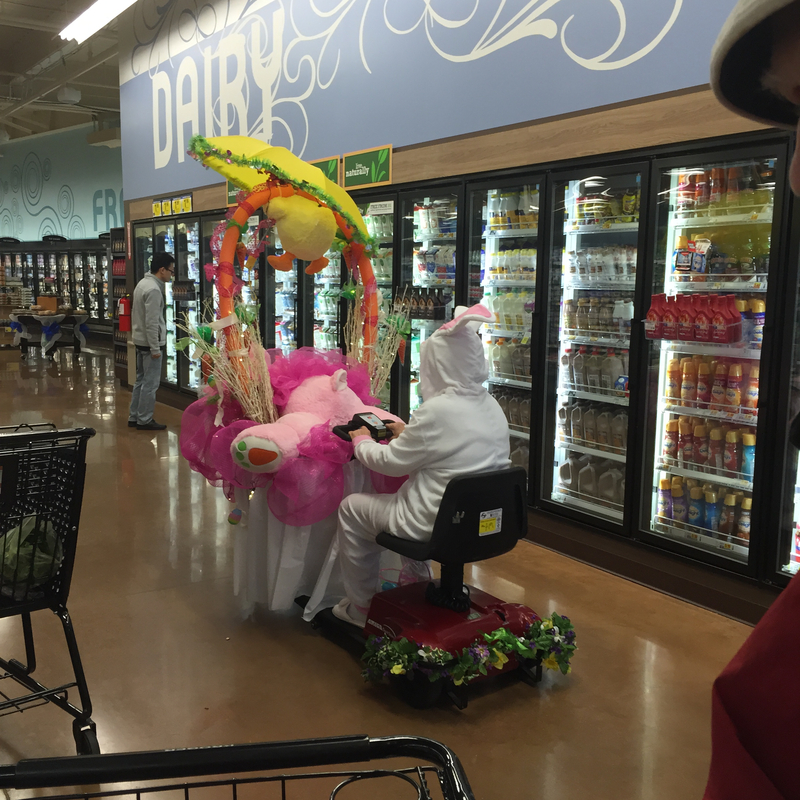 Do not confuse topnotch direction-giving employees with topnotch costumed employees: putting an employee in a rabbit outfit and having them drive around the store in a golf cart decorated as an Easter basket, the day before Easter, saying hullo to the confused shoppers, is not topnotch customer service. It’s an attempt to distract shoppers from their mounting frustration at having to walk a mile for bread and milk (located at opposite ends of the store). I put this type of distraction alongside the gorgeously designed book covers that hide their texts’ sloppy writing, worse editing, and sagging plots. However, thousands of badly-written, badly-edited gorgeous-cover books are published every year, and huge Kroger’s are popping up in cities across the mid-south region, so somebody’s buying. (“We have met the enemy, and he is us.”) Depending on my mood on a given day, I experience our apparent willingness to be distracted by rabbit-dressed employees and glossy covers as symbolic, as ironic, as disheartening, as hilarious. On my worst days, I believe we are burning like Rome burned, and fiddling around on our screens like Nero fiddled on his violin. Silver lining: there is a novel or twenty to be had by observing the fuel of our flames. And so my wish for you, dear writer friend, is that the sublimely ridiculous may inspire you today. * condoms used to be a necessity for me, but (thankfully) Engineer Hubby and I have eliminated the possibility of more kids. That said, part of the reason, IMO, that we are burning is that there are, simply, too many of us. We suffer from our species’ reproductive success. And *that* said, wouldn’t it make sense for us to support, nay, encourage!, those among us who don’t want kids? Making it difficult to avoid contributing to the problem of overpopulation. Again, really? But at this Kroger’s the condoms are LOCKED UP like they’re ammunition or prescription drugs. Again, really? If I were running the store, I would not only leave these unlocked, I’d place them beside the door. Perhaps with a little sign: “Donations accepted but not required.” Really. Because by the time shoppers get home from hiking through this store, they’re gonna need a foot rub from their partners, and that can lead to, y’know, mashing the potatoes … ah! If only tubers were included on the index. This entry was posted in Essays and tagged Art, Books, Easter, index, Kroger's, rabbit, rant, writing. Bookmark the permalink. I’d laugh too but I’m busy crying in my (fancy six pack of) beer. The one I got from the walk-in beer cooler that is the size of the entire first floor of my house. Preach it Sister! I lived in Cincinnati, home of Kroger, for over 10 years and have a love/hate relationship (mostly hate) with them. They were the first to come up with “Loyalty” card, and jacked up their prices. You’d think with all the mega stores they built in the Cinci area Kroger would get that something isn’t working right. I guess they get enough business to do what they want. Then, like in Lexington, those stores are novelties that pull in all the hillbillies from the East of Nowhere KY (I’ve lived there). Heh, in London KY the locals, from far and wide, talk about the “big” Kroger, which is the size of small AVERAGE Kroger anywhere else, certainly not one of the Mega stores. If you got your bagels, then slipped on a new pair of speedy running shoes, maybe you could make it to the parking lot with some free tubers. It’s the lawn furniture that gets me. Like I’m gonna tuck a wrought iron chaise on top of a loaf of bread?